The installer map is updated on a regular basis. The installer will uninstall the older version and replace it with the new one. I am constantly adding to and updating the map. There is a change log at the end. I have set up a listserve that I will send a message when I update one of my maps and a description of the changes. To subscribe bensman-garmin-maps-subscribe@yahoogroups.com No one can post on it but me. For the Windows installer, just run it. That is all you need to do to get the map into MapSource and BaseCamp. If you already have an older version of My Trails, the installer will first remove it. This is how to instal the maps on your GPS: http://www.gpsfiledepot.com/tutorials/how-to-load-maps-on-my-garmin-gps-unit/ Note: MapSource/BaseCamp uses a cache for its maps. Sometimes when you update the maps, the old maps still show in MapSource. If that happens, ctrl G 2 times will clear the cache and redraw the map. If when trying to load the maps you ever get an error message about not having enough space and you have more than enough, email me-it means I forgot to do something before creating the installer. The maps now cover 37 states including all of the Eastern US. These are transparent trails and points maps. They are meant to show things City Navigator does not have. These maps will show on top of whatever map you have loaded on your GPS (but you can only display one map at a time in MapSource/Basecamp). While they are optimized for use with City Navigator, they will work with any of the other maps on this site. There are very detailed maps for IL, MO, IN, CA, CO, OH, PA, DC, NM, AR, KY, Iowa, MN, GA, MD, FL, TN, WV, MI, DE, HI, ME, NH, VT, MA, CT, RH, NC, SC, LA, MS, AL, WI, NY, NY, KS, ND, SD, and VA. There are many places in these states that there is no coverage for. But they represent the best data I have been able to find on the Internet, from agencies, or other users. There is also some minor coverage in TX and OK and complete coverage in Yellowstone/Grand Teton NPs. The maps also have parking, restrooms, water, campgrounds, showers, scenic areas, boat ramps, buildings, picnic, etc. For some states like FL, there are extensive water Navigation Aides (daybeacons etc). There are also tens of thousands of trails obtained from numerous sources. There are also lots of unpaved roads (particularly in the National Forests). Many of the roads City Navigator does not have in parks are also inncluded in the map. Many of the maps have boundaries of things like Wilderness, Recreation Areas, etc. NOTE on NPS data. Some of thier data is extremely accurate and other leaves a lot to be desired. Some of the NPS POIs is extremly accurate. About 1/3 of the POI data's source is the maps they give you when you enter the park. So it can be significantly off. If you run accross bad locations, send me the correct cords and I will change it. Some of them I have corrected with GoogleEarth. Some of the trail data is extremly accurate. The source data for a few parks is the map they give you when you enter the park. So it can be way off. But it will be in the general location and you can send me a track with the correct location. Some of the NPS trails I have tried to correct in GoogleEarth. I started My Trails in 2006. It started out as just the ST Louis Area. Then I expanded to IL/MO. Then I started adding states I go to. Then I just started adding states. While I have GPSed a vast amount of this stuff, I want to thank all of those who have gave me data. There have been way to many to name. While I have lots of problems with the Forest Service, they normally bend over backwards to provide data (and some National Forests use my maps). The USWFS has excelent data that I have used. While I have had my run ins with the ACOE, they have provided me all the trail data they have whenever I ask for it. I have also obtained dta from the BLM. Many state agencies have provided me data via a request or having it posted on thier website. Many counties and local goverments have also provided me data. I have also found data on various websites that I have added. I want to specifically thank RTC for all the data I (and others have helped me) download from thier website-it is some of the best data out there. Many people have GPSed trails and sent them to me. The National Park Service "NPS" has been a mixed bag. They have lots of data on the Internet-some of it is of poor quality and other is extremely high. However, while every other federal, state, and local agency have been happy to help citizens better enjoy thier public lands, the same cannot be said for the NPS. For months they ignored my repeated requests for some trail data they had that was not posted on the Internet. Then I tried obtaining the data using the Freedom of Information Act which requires them to provide the data. The NPS expressed outright defiance for federal law and said I would have to pay them over $1,000 for the data (no one has ever charged me for data before). To defy Federal law, they claimed my pointing to this site and the thousands of downloads did not prove people use my maps or that I made them!. So a friend of mine has filed a pro bono lawsuit aginst the NPS asking the judge to order the NPS to comply with federal law and give me the files for free. These maps are copyrighted by me (and some of the data I have been provided also carries a copyright). A large amount of this data has been provided me with the restriction of non commerical use. For example, the RTC gpx files come with this restriction, "You may freely search, view, download and print the documents and information contained on this site for personal and non-commercial purposes only which is provided 'as is' without any warranty of any kind." Some states also contain OSM Data which is copyright OpenStreetMap.org contributors. Therefore, without my specific written permision (which assures copyright and non commerical use protection) these files cannot be modified or used for anything otjher than loading these maps onto a Garmin GPS or on your computer in MapSource, BaseCamp and whatever the Garmin MAC program is called. This product is reproduced from geospatial information prepared by the U.S. Department of Agriculture, Forest Service. GIS data and product accuracy may vary. They may be: developed from sources of differing accuracy, accurate only at certain scales, based on modeling or interpretation, incomplete while being created or revised, etc. Using GIS products for purposes other than those for which they were created, may yield inaccurate or misleading results. This information was released on Date:09022010. The Forest Service reserves the right to correct, update, modify, or replace, GIS products without notification. So everyone should be aware this data is not perfect and could be wrong. I have also included some Liability Statements in the change log. Note on WY: The WY map only contains Grand Teton and Yellowstone NPsand surrounding NFs. For the rest of WY, use NW Trails. I have lots of stuff (like the buildings) that NW Trails does not normally include. I've spent a couple of summers in the Tetons and it is my favoriate place in the world. So I wanted a really good map for it. Note on using the maps. This map is transparent. In MapSource and BaseCamp you have to zoom in to 7 miles with detail set to highest before you can see the map in MapSource and BaseCamp. Donations are also appriciated. I have spent thousands of hours working on this map. Before you contact me with an issue, make sure you read everything here. Most of the people who email don't bother to read the information on this page before emailing me about something answered above. If you have general questions about using the maps there is a forum to ask questions on. NEW FEATURE: Lots of people rightfully are not happy that in BaseCamp/Mapsource you can only see one map at a time. That is because Garmin won’t modify the programs to allow it. That stops you from seeing My Trails on top of other maps. My Trails is also not routable. 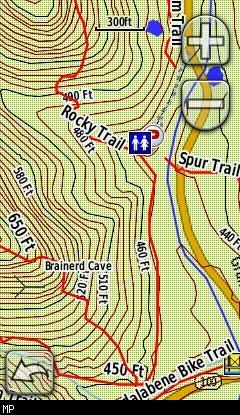 I like using tracks and the follow track much better than a routable trail on the map. As of the July 28, 2014 version, you can now extract the trails for noncommercial personal use. Then you can import the tracks into BaseCamp and show them on top of other maps. It also allows you to use the tracks to send to the GPS to follow the track. It is a pretty simple process. The directions are in the Read Me file that is installed in C:\Garmin\My Trails. This only works on a PC. If someone can figure out a process for a MAC, let me know. I get very few donations ($35 so far this year), but I enjoy doing this. However, I just spent $62 to upgrade GPSMapedit to make it easier to handle conflicting data and some other nice features like viewing GoogleEarth/Bing Maps directly in the program that will improve My Trails. I’ve made at least 100 edits with the new features already. So I would appreciate some donations to cover the $62. June 18, 2017: IL/MO: GPSed new connector for Zombie Trail and 1-64 Connector. Updated some places on the Eleven Point, Alley Springs Campground, and Current River SP. Several other updates. Thanks to Brian Yonke for some tracks at Fiery Fork Conservation area. MN: Thanks to Mark Modjeski for several trails CO: Thanks to Joe Grim for several tracks MI: Fixed transparency issue. December 6, 2016: IL/MO: Numerous edits along rivers. Did some updates of wing dike locations on the MO River. Thanks to Tim Robnett for an update to the Berryman Trail and a trail in Sam A Baker. I GPSed the extinction of the Riverfront Trail. AR: Some edits along the Buffalo River. TN: Thanks to Steve Hicks for a Bald River Wilderness Correction. CO: Thanks to Bryson Hicks for pointing out some data on www.14ers.com Thanks for Joe Grim for many more trails. KY: Thanks to Timothy Stephen for Turkey Run Park MTB Trail in Louisville. MN: Thanks to Mark Modjeski for the Nelson Trevino Canoe Trail. Added numerous boat access points. Also added the Mississippi River Water Trail. May 24, 2016: NY: Fixed an issue with the transparency. IL/MO: Worked on Millstone Gardens area and GPSed part of a trail. Lots of misc edits. Thanks to Jason Collier for a couple of trails. Added some stuff for Mingo NWR. Added some stuff along the Meramec River, Courtois Creek and Huzzah Creek. LA: Thanks Terry Simmonds for Poverty Point NHS trail. CO thanks to Joe Grim for several more trails. September 24, 2015: IL/MO: Rend Lake minor edits: Lakeside 370 Park minor edits. Edits to OZNSR. Added George Rogers Clark Discover Trail. Edits to McCully HP. Edits on Meramec River/Huzzah Creek. Edits to the Jack’s Fork area. I GPSed the Earth City Levee Trail extension. VT: Thanks to Tim Rapczynski for the 3 Trails. CT: Thanks to Alberto Dieguez for another section of the Mattabesett Trail. CO: Thanks to Joe Grim for some more trails. MN: Thanks to Mark Modjeski for several trails. NH: Thanks to Mike Berger for the Monadnock-Sunapee Greenway. WV: Thanks to Tom Skids for the Turkey Point Connector. NY: Thanks to Timothy Rapczynski for a trail. May 7, 2015: IL/MO: New trails at Riverlands; GPSed some new trails along the Meramac. GPSed the new construction on the Zombie Trail. GPSed the reroute of Jack’s Loop at Broemmelsiek Park. CO: Thanks to Joe Grim for over 100 trails. IN: Thanks to Rob Morrow for a trail in Paul C. Zona Sr. wildlife sanctuary. Thanks to Timothy Stephen for a couple of trails. MN: Thanks to Mark Modjeski for tracing some canoe trails (more to come). NJ: Added this: http://www.poi-factory.com/node/41305 AR: I GPSed some stuff in Buffalo Point. I got Buffalo River Trail, OHT, and several others from www.ouachitamaps.com/ Got lots of data from arkokhiker.org; Creative Commons Attribution (c)Arklahoma Hiker. Several other minor edits. December 14, 2014: IL/MO: Did a lot of work on the Tunnel Hill Trail and Ferne Clyffe SP. Thanks to Randy Meyer for pointing out the huntley–union–marengo trail which I found and traced from aerial photos. Thanks to Jason Collier for several tracks. I GPSed the MetroBikeLink Extension. I GPSed the Zombie Trail Extension. Many other minor edits. Thanks to Dan Baldenweck for GPSing the new location of the Rockywood Trail in Washington CO SP. CA: Thanks to Allan Runkle for several trails in the MT Baldy Area. NH: Thanks to Mohamed Ellozy for some trails in Oak Hill. NY: I got some trail data from http://www.poi-factory.com/node/43461 CO: Some minor edits. September 8, 2014: IL/MO: GPSed Indian Kitchen Trail and new trail in Vienna. Worked on Tunnel Hill Trail (including extension) with the aerial photos. GPSed the new extension of the Bush Greenway and the reroute of the Hamburg Trail. Did extensive work on the Eleven Point NSR and Ozark National Scenic Riverway. GPSed the Virgin Pine Trail in Pioneer Forest. Some other work in IL/MO. Thanks to Jason Collier for a reroute of Meramec Greenway. AR: Did some work on Buffalo National River and a couple of other things. July 28, 2014: Wow, My Trails has now had over 100,000 downloads! I am impressed and like how so many have downloaded it. I started My Trails in 2006. It started out as just the ST Louis Area. Then I expanded to IL/MO. Then I started adding states. Thanks to everyone who has contributed over the years. To celebrate 100K Downloads I am changing the copyright restrictions to allow you to extract data as described in the Readme File (C:\Garmin\My Trails) for personal noncommercial use. You can now get the trail data as tracks and view on other maps in BaseCamp and you can now send tracks to your GPS to follow. Thanks to John Nelson and Michael Rose for help with the directions. IL:MO: GPSed the parts of the Earth City Levee Trail that is open. Numerous other edits. CO: Thanks to Jeff Cook for GPSing some trails near FT Collins. I also did major work in the area with using some OSM data and looking at aerial photos in GPS MapEdit. Also did some work on Denver. July 3, 2014: IL/MO: New end of the MetroLink Trail. GPSed the new Zombie Trail. Hundreds of edits with the new software showing GE in the program. GPSed the Richland Creek Connection extension. GPSed the new work on the River Des Peres Greenway and the Carondelet Connector. IN: Many edits. KY: Some minor edits at LBL. PA: Thanks to Terry Simmonds for some tracks. I also did some editing with the new software. MI: Thanks to Andrew Hermiz for pointing out I had the projection wrong for the Sleeping Bear NL trails (which I fixed) and I also found buildings on the NPS website and added them. I also discovered Isle Royale was messed up with wrong projection. I went back to NPS data and it indicated it was some ancient projection which I could not convert. I used OSM trail data and did a good guess where the POIs were based on the trails and Bing Aerial Photos. Also did lots of more corrections with the new features of GPSMAPedit. MN: Thanks to Tom & Cindy Miller for some tracks. Also did lots of work with the new features of the program. May 7, 2014: IN: MAJOR UPDATE: IN’s Website had a new shapefile for trails. I added thousands of trails and there were hundreds of updates with better data. Took about 40 hours to do the update. There are some issues with a few trail names (mostly in cities) that have beginning and end instead of trail name. If any wants, you can send me waypoints with correct names. Il/MO: Removed Trail of Tears Trail, its roads, not a trail); some minor updates. NH: Thanks to Mohamed Ellozy for some new data. April 30, 2014: IL/MO: Thanks to Jeremy Vaughn of Shawnee National Forest for their most recent trail data. Lots of major improvements over the existing data. GPSed the Matson Hill/Oxen Mill Trails. GPSed a couple of new trails in the Dardeene Greenway and got some more from GoogleEarth. Added Schon Park. NH: Thanks to Mike Burger for the Dublin Trail. VA: Got some data from here: http://www.poi-factory.com/node/42371 NY: Thanks to Alan Herdzik for some of the North Country National Scenic Trail. CO: Thanks to Romano Giannetti for a track in North Table MT-I also traced some stuff there in GoogleEarth. March 25, 2014: Minor edits, new computer-making sure everything works right. December 17, 2013: CO: Added BLM Data around Grand Junction. NC: Lots of data for the Linville Gorge Wilderness www.linvillegorge.net/mapindex.php IL: Lots of edits in Southern IL; GPSed the White Rocks Nature Preserve. NJ: Thanks to Ed Campbell for some tracks in Wharton State Forest in NJ. MO: Thanks to Justin Blackwell for some data around the Current River. Some minor edits. Added some trails in Creve Cour CP. AR: Added some trails in Fayetteville traced in GE. October 22, 2013: IL/MO: Lots of stuff at Chicago Botanical Gardens via GE; GPSed new trails at Arlington Wetlands; lots of new stuff at 370 Lakeside Park; GPSed new section of the Lost Valley Trail; some work around the Meramec Greenway. I GPSed and extension of the River Des Peres Trail. Many minor edits. FL: Thanks to Ike Eisenstadt for some trails and POIs. CT: Thanks to Alberto Dieguez for another section of the Mattabesett. NH: Thanks to Peggy Madden for a summit correction and the Carter-Moriah Trail and Kinsman Ridge trail. Thanks to Mohamed Ellozy for several trails on Oak Hill. CO: Thanks to Jeff Cook for the Kruger Rock Trail. August 20, 2013: IL/MO: GPSed new nature trail at 2 Rivers NWR; GPSed the final section of the Bootlegger's Run Trail. CO: Many edits from my trip. Thanks to Jeff Cook for some trails and POIs in Pawnee National Grasslands. Thanks to Mark Severin for some trails. MA: Thanks to Alberto Dieguez for another section of the Mattabesett. WV: Thanks to Dave Morgan for the Beckley Rail Trail. NY: Thanks to Dave Morgan for the Camp Zerbe Trails. KS: Added Atomic Canon and trail; lots of stuff Konza Prairie. NH: Thanks to Mark Duckworth for 3 trails in Pack Monadnock Mountain. PA: Thanks to Dave Morgan for a couple of trails. IN: Thanks to Timothy Stephen for some data. July 19, 2013: IL/MO: GPSed the new Centennial Greenway and additions to the Chesterfield Levee and Nickel Plate Trails. Lots of other edits and additions including around Proffitt MT. CO: lots of edits (getting ready for vacation!). NH/RI: Thanks to Mark Duckworth for Horse Hill Nature Preserve in NH a big loop trail in RI, called Vin Gormley Trail. NC: Thanks to Dave Morgan for several trails. NC: Thanks to Dave Morgan for Dupont State Forest Trails and Jones Creek Trails. NY: Thanks to Mark Duckworth for the Pharaoh Mountain Trail. May 14, 2013: IL/MO: I gpsed the new Bluffview Trail and some at Arlington Wetlands. Thanks to Jason Collier for a trail at Creve Coeur Park, some at Sposs Memorial Park. Thanks to Josh Mitchell for trails in AR, CO, OH, MO, and KS. April 16, 2013: IL/MO: Thanks to Jason Collier for the White Rock Nature Preserve and a trail in Queeny & Trueman Parks. Several minor edits. VA: Thanks to Bryson Hicks for several trails and POIs in Cub Run Park. Thanks to Taylor Foust for the Rock Castle Gorge Trail. March 11, 2013: IL/MO: Thanks to Tim Robnett for a new section of the Bangert Island Trail, tracks for Matthiessen State Park, and new tracks and corrections for Starved Rock State Park. Several minor edits. IN: Thanks to Mike Cope for a trail in Vandolah Nature Preserve. Thanks to Mike Fromholt for several times in NE Indiana. FL: Thanks to Fredrik Coulter for Lake Woodruff National Wildlife Refuge Volusia Tract. SC: Some trails for Congaree NP. CA: Thanks to John Gord for a trail in Topanga State Park. January 29, 2013: NY: Finally finished all the new trails from DEC’s website. MD: Thanks to Fredrik Coulter for Big Gunpowder Trail. NC: Thanks to Dave Morgan for several trails. IL/MO: Some work on Rend and Shelbyville Lakes. Several minor edits. FL: Thanks to Fredrik Coulter for Gator Creek Reserve, Sabal Point edits, Malabar Scrub Sanctuary, Boundary Canal Trail, and Mud Spring Trail. December 23, 2012: NY: Still working on the new trails from DEC’s website. Still many to go. FL: Thanks to Fredrik Coulter for correct locations to Panasoffkee outlet project hiking trails, Lower Wekiva River Preserve, Pine Island Conservation Area, Tenoroc Fish Management Area, and Lake Beresford Park SD: Thanks to KidDylan for tracks in Newton Hills State Park. IL/MO: Lots of work around SIUE including 3 new trails (one still under construction but about done). I found lots of new trail data for Springfield MO on MO’s GIS website. November 9, 2012: IL/MO: I GPSed the MetroLink Trail extension and the Waynegate Nature Trail. Minor edits. Thanks to Walter Blume for a trail to Lee’s Bluff. IN: Thanks to Mike Fromholt for Anotehr ACRES preserve, Trails in Salamonie State Forest (3 Falls Trail), Trails at Fox Island County Park, Trails at Bicentenial Woods Nature Preserve Trails in Eagle Marsh Preserve, Winghave NP, and a trail in the McNab-Walter Nature Preserve. FL: Thanks to Fredrik Coulter for Boyd Hill, Historic Phillippi Estate Park and the International Speedway trail. Lots of new data from http://www.floridatrail.org/html/gps_data.cfm for the Florida Trail. Added Campsites, Water Sources, and Parking. Also some updates to the trail. CT: Alberto Dieguez thanks for another section of the Mattabesett Trail. WI: Thanks to Michael Young for about many State Park trails and POIs. VA: Thanks to Tom Littlejohn for trails in Shenandoah National Park. Made some corrections on the High Bridge Trail. NY: Thanks to Stephen Culhane for pointing out the DEC’s websites has numerous trails I do not have and doing a conversion for me. I still have a long way to go-over 2,500 tracks to still go through. So there will be lots more changes in future revisions. October 4, 2012: IL/MO: Thanks to Kyle Pacatte for a big section of the River to River Trail and some trails in Kaskaskia and Coffee Lake. I GPSed the Al Foster trail extension, new trails in Piasa Harbor, the Wayne Good Trail, and the Mississippi River Greenway. Several minor edits. Dakotas: Thanks to Kid Dylan for some tracks. Some minor edits. Thanks to Paul McCarty for numerous trails. WI: Thanks to Andy Schwartz for getting the correct location of part of the Great River Trail. VA: Thanks to Vytas Kavolius for more of the High Bridge Trail. I also traced some more of the trail. FL: Thanks to Fredrik Coulter for a trail reroute, the DeLand Greenway and the correct location of the Perry Oldenburg Mitigation Trail. CA: Thanks to Brian Hamilton for several trails. NY: Thanks to Stephen Culhane for a few tracks. August 24, 2012: Dakotas: Added North and South Dakota (look for more in the future) I downloaded trails and recreation POIs for the Black Hills National Forest, Badlands NP trails and some other data included. A few thinks traced in GE. Thanks to Paul McCarty for several trails. Added USFWS Trail and parking data. I was pointed to this site: http://northcountrytrail.org/trail/data/ It has the North Country Trail and many nearby trails. I have added their trail data for ND, OH, WI, MI, MN, and NY. There are hundreds of miles of new trails. I have also replaced some data that was not as good as this data. IL/MO: Some minor edits. NY: Thanks to Thomas Leahy for some trails in Wolfe Park. OH: Alex Hamling for the Miami Fort Trail. July 21, 2012: CO: Added numerous trails around Aspen from their GIS website. Thanks to Andrew Schwartz for pointing me to these trails. NM: Worked with Mark Hinch on getting Philmont much better. GA: Thanks to Terry Simmonds for the West Rim Trail at Cloudlands Canyon State Park IL/MO: Thanks to Kyle Pacatte for the 10 Mile Trail in Pyramid State Park; Alex Hamling for a trail in Peoria, A few more minor edits. CA: Thanks to Paul Reeves for the Mount Gower Preserve near Ramona, CT: Thanks to Alberto Dieguez for another section of the Mattabesett Trail. May 31, 2012: IL/MO: Thanks to Dan Baldenweck for some reroutes of the Berryman/Ozark Trails. 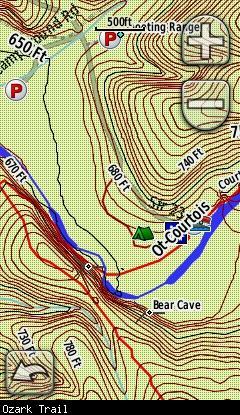 I GPSed some reroutes at Cliff Cave. Several other minor edits. FL: Thanks to Chuck Brown for Ulumay Sanctuary, Jefferson Preserve, Shingle Creek Preserve, Wiregrass Preserve, Morris Bridge Off Road Cycling Area, Jefferson Equestrian Area Longleaf Pine Preserve. Ike Eisenstadt: Lake Jessup Wilderness Area. NH: Michael Young, thanks for 60 miles of trails. CA: Thanks to Jack Glendening for trails in the Big Sur Ventana/SilverPeak Wilderness area. NC & VA: Thanks to Dave Morgan for some trails. NC: Thanks to Tim VanderKoy for Dupont Forest near Brevard. NM: Been working with Mark Hinch on Philmont-check back-work in progress. April 3, 2012: IL/MO: Many changes and edits in the STL area. NC: Dave Morgan thanks for trails in the North Carolina Botanical Garden. FL: Chuck Brown, thanks for many more trails and POIs. MS: Sipsey Wilderness: some waypoints from http://www.gpstreks.com/Sipsey.htm and thanks to Paul McCarty for a couple trails. February 26, 2012: IL/MO I GPSed most of a trail system on Principia College land West of Elsah-really nice. There is still more to GPS. Thanks to Tom Wolpert for a reroute of the Green Rock Trail and a new connecter trail in Greensfielder. Thanks to Shawnee National Forest for Horse related POIs, Highlines, crossings, and horse camps. Many other minor edits. FL: A special thanks to Chuck Brown who contributed about 600 trails and many POIs. Ike Eisenstadt Also contributed some trails. PA: Thanks to Mike Rubano for some trails. CA: Thanks to Todd Cottengim for some trails in Swasey Recreation Area. KY: Several minor edits. I GPSed some stuff and got some from GoogleEarth. IN: Some minor edits from GoogleEarth. January 4, 2012: IL/MO: Thanks to MDC for providing me all their trail data for State Parks. The quality varies. Some is better than what I already had. Some of my existing data was better, but for most parks I did not have any data. At the end is MDC’s disclaimer. 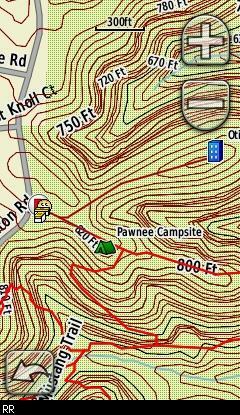 I also found GPS data for the entire Ozark Trail on the Ozark Trail Society’s website. Thanks OTS, it is really good data. I replaced all my Ozark Trail data with their data (and some other trails they had GPSed). I also did a lot of work with GE on connections to other roads and trails. Lots of stuff around Jeff City. I traced lots of stuff in GE and found Jeff City's GIS website. They had some good trail data on it-so thanks Jeff City. I GPSed a new trail in Creve Cour County Park (I think the day after it was built.) Springfield IL: Lots of work with GoogleEarth including a couple of new bike trails. Numerous minor edits. KY: Lots of work with GE around Louisville. IN: Lots of work with GE around Louisville and Evansville (and a little work in Indianapolis). OH: Lots of work in Columbus OH with GE. FL: Thanks to Ike Eisenstadt for GPSing a trail in Lowe Wekiva SP. MDC Disclaimer: Use Constraints: Although all data in this data set have been compiled by the Missouri Department of Natural Resources, no warranty, expressed or implied, is made by the department as to the accuracy of the data and related materials. This is not intended to be a survey product. Distribution Liability: Although all data in this data set have been compiled by the Missouri Department of Natural Resources, no warranty, expressed or implied, is made by the department as to the accuracy of the data and related materials. The act of distribution shall not constitute any such warranty, and no responsibility is assumed by the department in the use of these data or related materials. This is not intended to be a survey product. December 8, 2011: IL/MO GoogleEarth has some new September 2011 imagery for the ST Louis area. I traced lots of stuff with it including some new bike trail extensions including the Monarch Chesterfield Levee Tail. I GPSed some trails at Cliff Cave County Pak and made some corrections. I GPSed some more places but don’t remember them all but I have added some stuff fo the Lakeside 370 Park. I have added the Boschert Greenway extension to the KATY Trail. Part of it they were still paving and it should be completed any day. So part of the extension is just the approximate location I drew on the map. NY: Thanks to Brady Riedel for trail data for the Jamestown Audubon Society. He indicates "These were mapped by a park employee, and I verified parts of them against my tracks from today. They line up well." AL: Thanks to Paul McCarty for some trails and POIs near Cheaha State Park. AL/GA: Added lots of Pinhoti Trail data from: http://bbs.keyhole.com/ubb/ubbthreads.php?ubb=showflat&Number=749421&page=1 AR: Got a bunch of data on this site: http://www.ericstrongphotography.com/index.htm for several trails. FL: Thanks to Ike Eisenstadt for GPSing a trail in De Leon Springs State Park. MS: Thanks to Sam Hardin for many roads and trails. TN: Thanks to Eli Caudill for some POI data and georefeenced map of Mammoth Cave NP. I also did extensive wok on the park from some recent imagery in Google Eath. CO: Thanks to Carl Hurst for some tails in CO National Monument. I also traced a bunch of stuff from some new imagery in GoogleEarth. October 30, 2011: I have the problem with the mapset showing up 3 times on the enable screen on the GPS fixed. Thanks to eaparks for helping me figure out the problem. I also removed lots of duplicates in several maps. WI: I had the transparency set wrong which causes huge problems with the trails not showing up on the map. Its fixed now. Thanks to Mark Madsen for GPSing some trails. I also used GoogleEarth to add a few things. IL/MO: I got the missing new connector trail in Greensfielder. I also got a couple other new trails in the area. I added several places to Calvary Cemetery. Several other minor edits. CT: Thanks to Alberto Dieguez for more on the Mattabesett Trail. NC: Thanks to Arthur Binder for several trails. He stated, "Some of them I downloaded from the Carolina Hiking Club, for some I dowloaded maps and then traced them on Google Earth, and a few I recorded with my GPS." Thanks to David Creech for GPSing a trail. I also obtained some data from OSM-see notices below. "The National Park Service shall not be held liable for improper or incorrect use of the data described and/or contained herein. These data and related graphics (i.e. GIF or JPG format files) are not legal documents and are not intended to be used as such. The information contained in these data is dynamic and may change over time. The data are not better than the original sources from which they were derived. It is the responsibility of the data user to use the data appropriately and consistent within the limitations of geospatial data in general and these data in particular. The related graphics are intended to aid the data user in acquiring relevant data; it is not appropriate to use the related graphics as data. The National Park Service gives no warranty, expressed or implied, as to the accuracy, reliability, or completeness of these data. It is strongly recommended that these data are directly acquired from an NPS server and not indirectly through other sources which may have changed the data in some way. Although these data have been processed successfully on computer systems at the National Park Service, no warranty expressed or implied is made regarding the utility of the data on other systems for general or scientific purposes, nor shall the act of distribution constitute any such warranty." August 8, 2011: IL: Numerous changes including lots of work around Carlye Lake identifying areas with GoogleEarth. WY: A huge upgrade-I expanded the area around Grand Teton and Yellowstone NPs. I added lots of Yellowstone NPS road data for unpaved roads, etc. I also added and corrected many things in and around the NPs with GoogleEarth-added lots of parking areas. Added parking and some roads to the National Elk Refuge. Thanks to Judy Warrick for sending me trails and recreation POIs for the Caribou-Targhee National Forest. Some of the trails conflicted with NPS trail data. The NPS data was differential GPS so I went with the NPS data. Thanks to Brian Goldberg for sending me about 3,000 miles of trails and recreation POIS for Bridger-Teton National Forest. I also added quite a bit of the Confidential Divide. I started with a file from the NPS and traced more on USGS 24K maps. July 22, 2011: IL/MO: Mark Madsen GPSed some more trails in the Chicago general area (mostly McHenry). He also provided some corrections and some POIs including a bike campground. I also added some more stuff from OSM (see notice in last update). I also added a bunch of stuff in the Chicago vicinity by tracing in GoogleEarth. I added a bunch of stuff to some nature preserves and did a lot of work on Moraine Hills State Park. There was also a couple of minor edits in the STL area. FL: Added a bunch of new stuff from http://www.outintheboonies.com/ I also added quite a bit of stuff by tracing it in GoogleEarth. July 19, 2011: IL/MO: Thanks to Mark Madsen for corrections to the North Branch Trail. I've worked on several trails in the Chicago area by tracing in GoogleEarth. I found some general maps for some major trails and located them in GE. I've also been working on the Fox River Trail with GE trying to correct some errors and add missing parts. In the Chicago area, I have added hundreds of neighborhood trails that came from OpenStreetMap. "Map data (c) OpenStreetMap contributors, CC-BY-SA". http://www.openstreetmap.org/ http://creativecommons.org/licenses/by-sa/2.0/ . Some of it was fine tuned in GE. Added the bike trail at Scot Air Force base. Numerous other changes. WI & IN: A couple of minor edits and added a few trails from OSM. NC: Added a couple of trails and POIs from Dave Morgan; added a couple of things that were incorrectly placed in TN. TN removed some stuff that belonged in NC. July 5, 2011: IL/MO: Numerous Changes including the 370 Lakes park, the Centennial Trail connection to the KATY Trail, some edits in Forest Park, several changes in the Bloomington/Normal area. CA: Added about 100 trails and many POIs and made several corrections in the Ventana/SilverPeak Wilderness area from http://ventanahiking.net/ Thanks to Jack Glendening for the data which is copyrighted for non commercial use. He tells me he has GPSed most of it. June 6, 2011: Numerous changes including Monarch Levee Trail CO: Thanks to Ryan Franz for over 100 new trails including some that just opened in the last couple of weeks NM: Added some trails from: www.sandiahiking.com and fixed a few double trails IN: Thanks to Mike Cope for some trails and POIs; State trails updated with 4/11 data; Some double trails dealt with; Some planned trails added by mistake were removed. March 28, 2011: AL: Thanks to Ashley Peters of the Ala. Dept. of Conservation and Natural Resources for about 200 trails in Forever Wild Areas. Some of them where GPSed but not with a high sensitivity receiver-i.e., the quality of some is really bad. I’ve cleaned some up but some are not that good. MO: Thanks to Tom Wolpert for a track of part of Bufford Conservation Area. IL/MO: Several minor edits. TN: Thanks to Shannon Bradley for some trails and POIs in the Frozen Head area. PA: Thanks to Mike Rubano for some trails and POIs. Iowa: Some minor edits. Bathrooms and Water are now searchable for: AL, TN, Iowa, LA, MA, DC, MD, PA, DE, NJ and AL. March 18, 2011: CO: Thanks to Ryan Franz for some more trails; also a few more edits. CA: Thanks to Ryan Franz for some trails. AR: Minor Edits IL/MO Many Minor edits FL some minor edits Bathrooms and Water are now searchable for AR, CA, and FL. February 28, 2011: NC: Thanks to the Forest Service’s Holly Hixson for converting their trail data so I could use it. I added aver 500 GPSed trails. The Forest Service told me, "Yes, most of our AT data has been GPS'd, although there have been several sections I understand that have been re-routed in recent years; we should have much of it captured." So I went with the Forest Service AT data instead of the data from the AT website. Holly also told me the hundreds of trail POI data that I found on their website may not be Forest Service data. Holly was not sure if the campsites were illegal sites and asked that you check the sites first. However, the POI data appears to be extremely accurate (other than bridges-I moved some to put them on the trails). Overall, the NF data appears to be some of the best quality I have. TN: A couple of very minor edits. IL/MO: Reroute in Lone Elk CP. Several minor edits. February 26, 2011: NC: The trail data for the Pisgah and Nantahala was all messed up-I had the roads not the trails. I’ve asked the Forest Service to send me the correct data and hopefully I will have it soon. I removed all the roads that were on the map as trails. I put the class 1 and 2 roads back on the map as unpaved roads. I also found hundreds of trail POIs like fords, bridges, campsites, shelters, vistas, water sources, etc. I have added them. As soon as I get the trail data from the Forest Service I will upload a new version of My Trail. IL/MO: many minor edits. February 20, 2011: IL/MO: Add extension of Madison County Bike Trail; many other minor edits including several in Marquette Park. Made adjustments for corrections in City Navigator 2011.4; Reroute of Riverwoods Trail; Thanks to Glenn Wolters for GPSing a trail at Weston Bend State Park-I did some more work on the park with GE. FL: There were some messed up trails in Balm-Boyette Scrub and I used GE to greatly improve the area. CO: Some minor edit to the Dike trail and the area around it. MD/PA: Added a few RTC trails and some minor edits. KY/TN: Big South Fork NRA added 141 trails from Trails Co Op. They are not real accurate. I was able to adjust a few of them with GoogleEarth. Did many more edits in TN and many more in KY. CA: Removed several double trails. MN: Removed a couple of errors. GA: Added a bunch of campsites, bathrooms, water, parking, shelters and side trails to the AT from http://www.georgia-atclub.org/trail/map.htm Carolinas: Removed some double trails on the AT. IL, MO, HI, AR, KY, LA, AL, MS, OH, and WV changed ship wreck to another type to show up in POI search on GPS. February 11, 2011: Thanks eaparks for making me Island, Falls, Arch, and Rest Area icons. CA: Major additions-hundreds of trails. Added Channel Islands NP trail and road data from NPS website. Added lots of stuff for Pinacles NM from NPS site and traced some trails in GE. Point Reyes National Seashore trails from NPS website. Added lots of stuff from Trails Co-Op. Lots more stuff to add and will be adding more. Some of the data was pretty far off and I corrected it in GoogleEarth. Added about 30 new trails from RTC. IL/MO: More work on Starved Rock and Cache River. Several minor changes. CO: Added about 50 trails around Durango from Trails Co Op. It has not been GPSed and looking at it in Google Earth, it is a bit off. But everything appears to be reasonably close. So it would take several hours to correct it in GE and I did not think it was worth the time. I also traced some other stuff around Durango in GE. NM: Thanks to Barry Steger for GPSing a couple of trails in Northern NM. He also gave me some trails he GPSed in TX. I added them to the NM map. KY: The NPS site Big South NRA had trails for one of their quads in KY. It is 24K data (tends to be fairly close) and none of the trails have names. TN: Big South NRA had two quads that had some trails and unpaved roads. See note for KY.
February 3, 2011: IL/MO: GPSed some trails in the Cache River State Natural Area and made some other corrections/additions in the area. 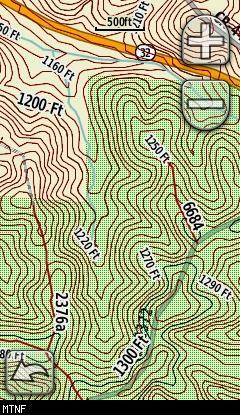 Worked on Rockford and Rock Cut SP tracing from GoogleEarth. Thanks to Jeremy Vaughn for Shawnee NF's 2011 trail data-replaced older data (made a major improvement). Worked on Weinberg-King, Goose Lake Prairie, Starved Rock, and IL Beach State Parks. Thanks to Dan Baldenweck for a reroute of the Chubb trail. Several other minor edits. KY Added NPS Trails in Cumberland Gap from Trails Co Op and worked on Cumberland Gap (some of this is actually in TN and VA-but it is all on the KY Map). Added a few other trails from Trails Co Op. CO: Added many trails from Trail Co Op (made some adjustments with Google Earth) AL: Added some trails from Trail Co Op OH: A few minor additions I traced in GoogleEarth, added part of the Buckeye Trail in East Fork State Park from Trimbleoutdoors and a few other things. "Neither the Department of Natural Resources, nor any of its programs nor any of its employees shall be held liable for any improper or incorrect use of the information described and/or contained herein and assumes no responsibility for anyone's use of the information. In no event shall the Department or its employees be liable for any direct, indirect, incidental, special, exemplary, or consequential damages (including, but not limited to, procurement or substitute goods or services; loss of use, data, or profits; or business interruption) however caused and on any theory of liability, whether in contract, strict liability, or tort (including negligence or otherwise) arising in any way out of the use of this system, even if advised of the possibility of such damage. This disclaimer of liability applies to any damages or injury, including but not limited to those caused by any failure of performance, error, omission, interruption, deletion, defect, delay in operation or transmission, computer virus, communication line failure, theft or destruction or unauthorized access to, alteration of, or use of record, whether for breach of contract, tortious behavior, negligence or under any other cause of action." January 18, 2011: For several states, I have added lots of stuff (docks, dams, wrecks, daymarker, navigation line, etc) from the ACOE’s navigation charts from http://crunch.tec.army.mil/enc/echarts/IENCShapeFileRequest.cfm Thanks to Dale Dodson from the US Army Geospatial Center for additional shapefiles not on the site. LA: Thanks to Joel E. Harrison II for trails and recreation POIs for KISATCHIE NATIONAL FOREST AK: Worked on Buffalo National River using GoogleEarth to correct many locations. Also started adding trails from the USGS 24K maps the NPS has on their site. IL/MO: Several minor edits including adding USGS 24K trails from the Ozark National Scenic Riverways site. Look for a future update with some fine tunning on this data. January 9, 2011: Minor edits to IL, MO, CO, and KY. Corrected a big problem with the zoom levels in IL/MO introduced on last update. January 6, 2011: CO: Did quit a bit of work on the National Forests. Added hundreds of recreation POIs. I also updated many trails with more up to date data and added many new trails. All of the trails in the White River NF were redone-I replaced old data that was not very accurate and did not have trail names. Thanks Lisa Leeman for pointing me to R2 GIS site. IL/MO: Several minor edits including Malcolm W Martin Memorial Park. Added some trail, boat ramps, and marinas from the KC ACOE (thanks Kim Penner). Also messed with zoom levels, IN: Thanks to Kevin Ratcliff for some McCormick's Creek State Park Trails-Some other minor edits removing double trails FL: Corrected a double trail; AL: Thanks to the Forest Service (Stanley Glover) for the National Forest trails and recreation POIs. They point out, "One thing I wanted to mention is that all of these data set are incomplete. All of these are in the process of being updated." MS: Thanks to the Forest Service (Brenda L. Miller) for sending me all the trails and Recreation POIs for the NFs in MS. KS: Added Cimarron National Grassland trails and POIs. Added over 1,000 trails from the KC ACOE and many boat ramps and marinas. December 24, 2010: NY: Thank you FS for Finger Lakes National Forest Trails and Recreation POIs. They pointed out, "Trails and Trail Uses are always being updated, and we know some trails are inaccurately displayed and the table is not up-to-date. This is what we have this moment. Remember that when you use this stuff." VT: Forest Service sent me their trail data and recreation POI data for the Green MT National Forest. I previously had the trail data from another source, but it had trial number instead of name. So I replaced it with the new data. See note in NY about the data. IL/MO: Many minor updates; worked on SIUE Moved some stuff from My POIs to My Trails LA: Kisatchie National Forest: added some Forest Service roads from thier website. Moved a few things from My Trails around LA's highpoint. KS: A couple of minor changes in KC. AR: A few minor edits.